Feeling overwhelmed by social media and social networks? Does it occasionally seem that all this connectivity comes at the expense of your free time? Struggling to decide whether to follow back or friend up that guy you met at the local Chamber of Commerce event whom you don’t really know, but might be a useful contact some day? Maybe it’s time to set some social media limits. Unless you’re a professional athlete, or just happen to be the guy from my high school whose entire life revolved around the french horn, you probably have a multitude of interests. Finding other people with similar interests and connecting with them is the whole point of social media. I’m not suggesting that you only friend/follow people you actually know in “the real world”. That’s just an electronic version of your current address book. What’s the point? 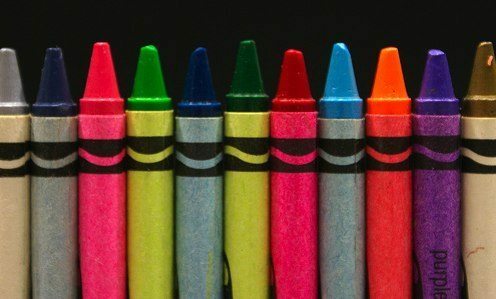 But, to avoid driving yourself crazy with Facebook and Twitter and Linkedin and Ning and Myspace and Flickr and Slideshare and YouTube and whatever-else-you’re-into-Tube invites and distractions, here’s my recommendation for creating some order amidst chaos. (incidentally, “order amidst chaos” was the runner-up for the name of this company. Convince & Convert won based on concerns about people misspelling chaos). This may sound ridiculous, and it certainly is Amish-level old school, but it absolutely works. Grab a piece of paper and a pen and write down all the things in the world that you are interested in and about which you can contribute. The second part of that equation is key. I’m moderately interested in learning how to make balloon animals, but I have literally nothing of value to add to the balloon animal community. Remember, one of the 5 ways to be a social networking smash is to be helpful. Look at your piece of paper. If there are ten or fewer areas of interest written there, you’re all set. Move to step 3. If you have more than 10, narrow down to the 10 that are most vital to you. How do you narrow? Imagine yourself sending tweets at 2am about that subject. Does the thought of doing so make you frustrated, or excited? If it’s the former, cross it off. In the interest of transparency (or translucency, the term Beth Harte coined that I prefer), here are my 10 in no particular order: Flagstaff, Greater Phoenix, Food/Wine, Social Media, Email, PR, Fantasy Football, Jeep, Travel/Home Exchange, Indie Rock. I find the best way to do this is with Facebook friends, but you may find better results using Twitter followers or some other collection of connections. Look through your current contacts and put a hash mark next to whichever of your 10 interests each friend shares. This doesn’t have to be a massive spreadsheet or anything, but taking the time to look at your current contacts and examine WHY they are connected to you will help create social media limits. Take your piece of paper and pen and draw circles for each of your 10 interests. If the interests (or the communities around the those interests) intersect, create intersecting circles. The idea is to find 5 or 6 interests that you love, but that also are related enough so that you can introduce people from one community to people in another community. This is the digital equivalent of having a dinner party, and inviting groups of friends that you love for different reasons, many of whom don’t know one another. 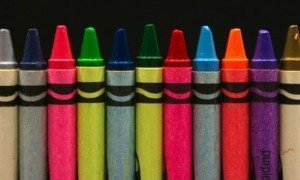 Making those introductions – those connections – is what being a good host and community member is all about. The best way to narrow your list of 10 interests to 5 or 6 is to better understand how you can tie your communities together. Flagstaff and Phoenix interesect a lot because a lot of people I know spend time in both places (like me). I’m interested in food and wine in Phoenix, but more so in Flagstaff, because that’s where I review restaurants. 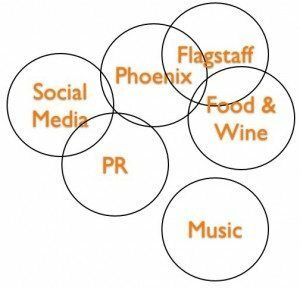 Social media and PR are of course related communities, and because I used to work in those industries in Phoenix, those communities overlap a bit. The outlier here is music. I’m a big indie rock guy and have been for 20+ years. But, I’m finding that I spend less time in that community than I used to, and examining my spheres, I can see why. There’s little time efficiency or connectivity potential. If I had to cut out an interest to make more time for the rest, that would be the one I’d throw overboard. Presto! By identifying your spheres, you’ve created natural social media boundaries. Now, use those boundaries as a filter for future connections. If somebody wants to connect with me and they are a member of one my six spheres, chances are I’ll friend/follow them back. If they aren’t a member of one of those six, I probably won’t connect – although balloon animal professionals are always welcome. What are your spheres? Will you list them in the comments?